In 2012, the New Orleans Hornets (now Pelicans) were owned by the NBA and were not in the best shape after losing Chris Paul to the Los Angeles Clippers. The league needed to offload it onto a private entity, so they allegedly sweetened the deal for New Orleans Saints owned Tom Benson by rigging that year’s NBA draft to give the team Anthony Davis with the first pick. 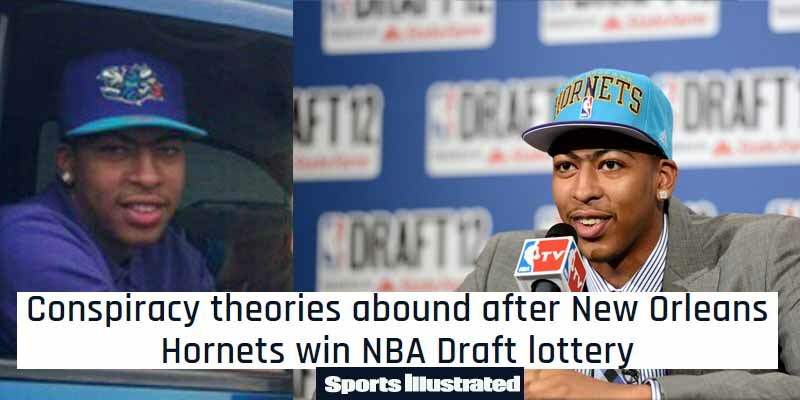 The main piece of evidence from the conspiracy theorists was a photo of Davis wearing a Charlotte Hornets hat a couple of weeks before the draft, but according to Adrian Wojnarowski, of Yahoo Sports at the time, there were even people within the organization that suspected foul play. “The reaction of several league executives was part disgust, part resignation on Wednesday night. So many had predicted this happening, so many suspected that somehow, someway, the Hornets would walk away with Davis. That’s the worst part for the NBA; these aren’t the railings from the guy sitting at the corner tavern, but the belief of those working within the machinery that something undue happened here, that they suspect it happens all the time under Stern,” wrote Wojnarowski in his opinion column.